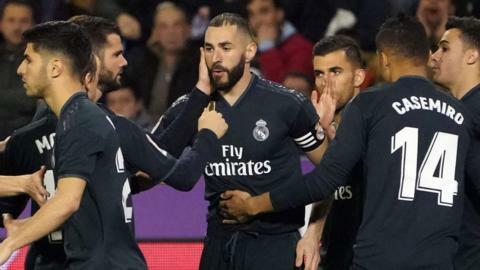 Real Madrid come from behind to beat Real Valladolid in La Liga, although the result is unlikely to relieve the pressure on head coach Santiago Solari. Lionel Messi scores one penalty and misses another as Barcelona beat Real Valladolid to move seven points clear at the top of La Liga. Sevilla go one point clear of Barcelona at the top of La Liga following victory over mid-table Real Valladolid. Real Madrid grab a fortunate victory against Real Valladolid in Santiago Solari's first La Liga game in charge.